Coppa, the intimate, nose-to-tail themed enoteca nestled on the quiet corner of Shawmut Avenue and Milford Street in Boston's South End, features a menu of Italian small plates made with locally sourced, sustainable ingredients, complemented by an eclectic wine list and unique, cordial-based cocktails. 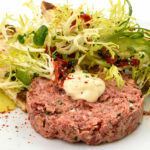 A collaborative effort from chefs Ken Oringer and Jamie Bissonnette, Coppa is the perfect destination for pre-dinner aperitivi, several courses of delicious stuzzichini (Italian small bar snacks), or a late-night cocktail or glass of vino. During the cooler winter months, diners enjoy house-made charcuterie, wood-oven pizzas, and handmade pastas in the inviting and cozy forty-seat dining room. In the summer months, the culinary fun moves outside onto the brick patio which seats another twenty-four. New Jersey native Ken Oringer’s career began inauspiciously; washing dishes in a local restaurant as a teen. He caught the kitchen bug, however, and went on to study restaurant management at Bryant College in Rhode Island and then received a degree from the Culinary Institute of America in Hyde Park, where he was voted Most Likely to Succeed by his classmates. After graduation, Oringer’s first position was at David Burke’s River Café in New York, followed by a pastry chef position at Providence’s legendary Al Forno and sous cheffing under Jean Georges Vongerichten at the Marquis de Lafayette in Boston. Next, he briefly operated Terra Trattoria in Greenwich, Connecticut, which won three stars from The New York Times. In 1992, Oringer moved to San Francisco and became chef de cuisine at Silks in the Mandarin Oriental Hotel. There, his distinctive, Asian-accented style, and flair with cutting-edge ingredients began to get noticed. Conde Nast Traveler magazine listed Silks as “one of the top 20 restaurants in America.” Raves followed in Gourmet. In 1995, Oringer returned to Boston and won praise for his work at Tosca in suburban Hingham. Within a year, the restaurant was dubbed “Best on the South Shore,” and Oringer was profiled on CNN. In 1997, he and a partner opened Clio in Boston’s Eliot Hotel, with a contemporary French-American menu that married skilled technique with an artful, Asian-inspired approach. The restaurant’s phenomenal success catapulted Oringer’s reputation into the stratosphere and the accolades never stopped. Clio has been a Gourmet magazine Top Table, and has been lauded in most national magazines and daily metropolitan newspapers. Oringer has also appeared on several Food Network shows as guest, cook and winning contestant. After nominations in 1998 and 1999, he won The James Beard Foundation’s Best Chef – Northeast Award in 2001. Intellectually restless and an enthusiastic traveler, Oringer eventually sought new outlets for his culinary curiosity. In 2002, he opened Uni, an intimate sashimi bar in Back Bay. In 2005, he opened Toro, a Barcelona-inspired tapas bar in Boston’s trendy South End. In 2007, he opened La Verdad, an authentic Mexican concept located adjacent to Fenway Park, and lent his name and knowledge to KO Prime, a modern steakhouse in Kimpton’s Nine Zero Hotel on Beacon Hill. In 2009, he opened Coppa with fellow chef Jamie Bissonnette. Diversification aside, Oringer is known to be a hands-on kind of chef who can often be found manning the stove at any of his restaurants, procuring farm-raised beef at local farms, or creating surprises for patrons at Uni.